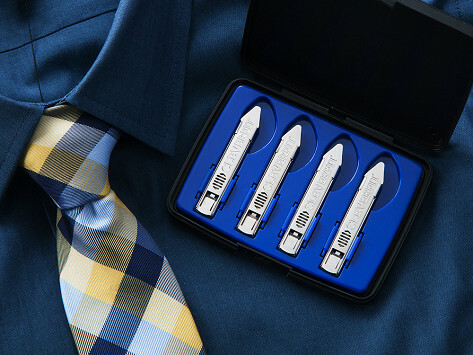 Get that crisp, collar perfect look with one pair of durable, adjustable collar stays. 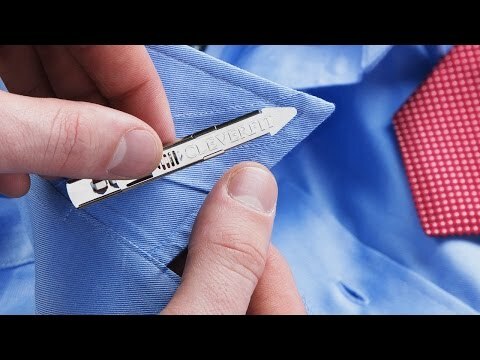 Crafted from stainless steel, CLEVERFIT is like a collar stay chameleon—adapting to casual, business, or formal collared shirts for a clean finish. Multiple precision settings for universal sizing: 2.18”, 2.37", 2.56", 2.75", 2.93", 3.12", 3.31", 3.50"
Dimensions: Case": 4" x 0.5" x 3"; Each stay: 2.25" x 0.3" x 0.05"
My mornings just got a whole lot easier when dressing for work! This adjustable collar stay works on all of your collared shirts, adapting to your casual, business, or formal looks for a crisp, clean finish. Traditional plastic stays usually come in a fixed size and are flimsy, too. CLEVERFIT’s extendable design is crafted from polished stainless steel. It’s sturdy, reliable, and ready to adapt to different button downs. Maker Sherif Zaki was tired of digging through his messy mound of collar stays that had accumulated on his closet floor—trying to find the right size and then its matching pair. He came up with his durable, chameleon design that works with different collar sizes and styles.